I have been waiting forever to make this post for you guys! Bone broth is something I had been sipping and slurping since I was a teeny thang, thanks to my Korean roots. In Korean culture, that silky, rich broth is a go-to for cold weather days, sick days, and days after a rough night out. I didn't realize this back then, but bone broth is ridiculously nutrient dense and healthy. Bone broth is also one of the foods I credit for helping heal my gut health and managing my inflammation from my autoimmune disease (Hashimoto's), thanks to the abundance of collagen and minerals that get extracted out of those grass-fed bones. So I was constantly buying cups of it while out and about, but it can put a cringe-worthy dent in your wallet at anywhere from $7-10 for a cup. I have been dying to make my own at home in big batches so I could keep it in my fridge for easy reheating throughout the week. However, my previous apartment had literally zero space for me to store a big ol' stockpot, unless I wanted to keep it in the bathtub, so I kid you not when I say one of my first cooking priorities when I moved into my new place, was to get a kickass stockpot to make this regularly. I knew a few things from experience and after researching many varying recipes and tutorials on how to make bone broth: it was important to get a good quality stockpot that retained heat well for two reasons: first, you'll be simmering this broth anywhere for 6-10 hours (ideally, even more! ), so you want something that can retain heat well so you can set your burners to the lowest setting and save energy. Second, it's important for the pot to evenly be heated throughout for the perfect simmer to best extract all the nutrient goodness out of those bones. All-Clad has always been kind of like the Maserati of stainless steel cookware to me and my first choice for high-performing and durable pans, but this All-Clad d5 Stainless Steel 12 quart stockpot has been beyond my expectations. Not only is it beautiful and shockingly light for having such a large capacity, but the performance has been nothing but perfect for the several test batches I ran. I chose the 12 quart because I wanted to be able to make a super big batch to be able to keep in the freezer, so I don't have to make it every week-- and the bones take up a LOT of room in the stockpot. You should know that bone broth isn't as intimidating as it seems at all. If you've ever roasted anything (veggies, meat, whatever!) and simmered something before, you can absolutely make this. It is really time consuming in the sense that it takes so many hours of simmering to be complete, but the actual amount of time spent doing hands-on things just amounts to prepping a roasting sheet, roughly chopping veggies (no fancy knife skills needed, hurray! ), and bringing things to a boil then simmer. That's it! It's the perfect thing to make during a meal prep day or a Sunday when you're doing chores like laundry and cleaning. Once you have all that broth done and made, you can use it in virtually anything to give your foods a major nutrient boost-- and it's so easy having it right on hand in the fridge to make quick weeknight meals! I love making my shroom super soup with it, but I also use it to make things like quinoa, purées, or just sipping it straight from a mug for a deliciously warming drink. It is THE perfect thing for fall. Are you guys ready for this? I think so! Some of you are more visual learners, so if you want to watch a video tutorial of making the bone broth, I took over @thefeedfeed on Instagram today to show you guys! If you aren't on Instagram, you can watch the full episode of my takeover series here on their website. 1. Preheat oven to 425ºF. Arrange beef bones and garlic on a roasting pan. Place roasting pan in oven for 20-25 minutes. Flip bones and garlic over to ensure even browning, then continue to roast for another 30-40 minutes until deeply browned and fragrant. Remove from oven and set aside. 2. Place all veggies, bay leaves, peppercorns, and apple cider vinegar in stockpot. Add roasted bones, garlic, and pan drippings, then fill stockpot with water until bones are covered + 1 inch. 3. Cover pot and bring to a boil over medium-high heat. Reduce heat to a very low simmer and ventilate pot by leaving lid slightly open. Continue to simmer for a minimum of 6 hours but up to 12 hours (the longer, the better), occasionally stirring and skimming excess fat off the surface. 4. When finished cooking, carefully strain broth using a fine-mesh strainer. Discard bones and vegetable remnants. If serving immediately: Add in any flavorings to your preference, such as chili flakes or oil, lemon juice, etc. Use an immersion frother to emulsify, then serve. If storing: Bone broth can breed bacteria if left to cool down on its own, and you don't want to stick hot containers of broth in your fridge (as it will lower your fridge's temperature and cause other items to spoil). You can add a few ice cubes to the stock to help speed up the process, or pour broth into tightly sealed glass jars and submerge in an ice bath. Broth can be stored for up to 5-7 days in the fridge, and up to 6 months in the freezer. Special thanks to All-Clad for partnering on this recipe + post! 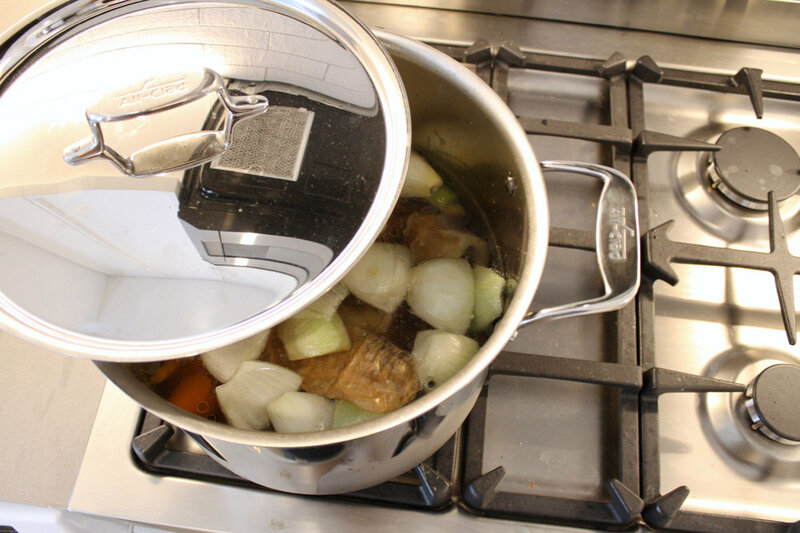 Shop their amazing stockpot that is amazing for cooking bone broth, here. Baked Autumn Cauliflower "Au Gratin"